Want to look like one of the crew? 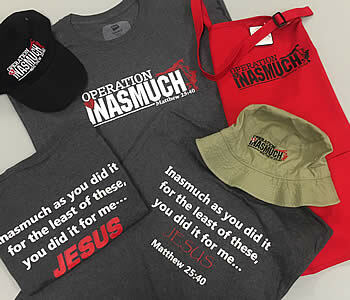 Next time you’re at the ministry center, pick up some Inasmuch merchandise! Aprons, T-shirts, and Beachcomber Hats & Caps are available for purchase. All of the proceeds from your purchase go right back to Inasmuch. These funds support our Breakfast program, Lodge, and Frink St. By buying these items, you are helping in the fight against homelessness in Fayetteville. You can support our ministry, and look cool, too! We are grateful for your continued support, and look forward to seeing you in the future!